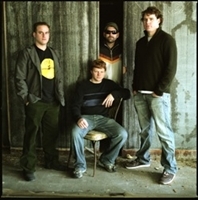 The Disco Biscuits have brought together the worlds of jam bands and electronic music with its “trance-fusion” sound that mixes the free-form improvisations of jazz with the hypnotic rhythms which provided the soundtrack for rave culture. The Disco Biscuits are in their eleventh year of realizing their goal of making some of the “wildest and craziest” sounds around. The quartet, which consists of Jon Gutwillig, Marc Brownstein, Aron Magner and new drummer Allen Aucoin, continues to delight audiences around the globe with their unique fusion of rock, electronica and classical music. After a brief break from constant touring, the Biscuits are back on the road electrifying audiences from coast-to-coast, including performances at the Bonnaroo Music Festival and Lollapalooza. Enjoy the musical mayhem and irresistible grooves of the band via their new double live album, The Wind at Four to Fly. The album features tracks that were pulled from the final performances with the band’s original lineup. Rocket 3 is the entire third set of the Biscuits’ 2004 New Year’s performance in New York. Regarded as one of the best sets of music the band has played in years, this limited-edition three song collection is as much a nod to the past as it is a glimpse into the future. Recorded during the final performances with the band’s original lineup, the album delivers two full discs of unadulterated Bisco madness!